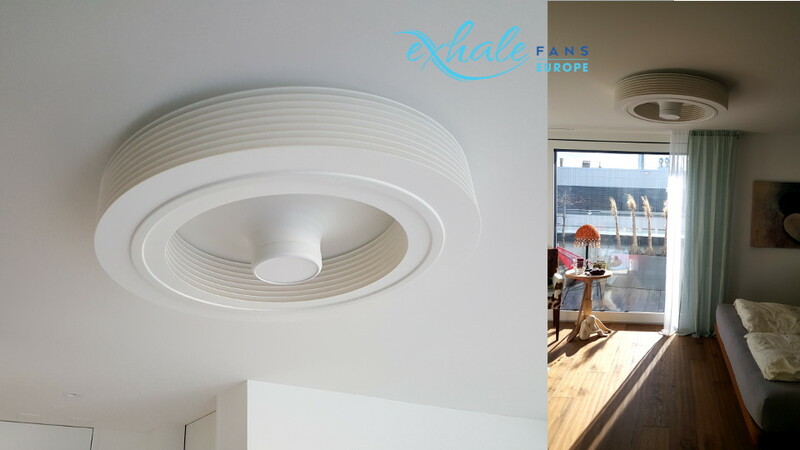 "We used the fan for first time last night - brilliant - so very quiet. Like no other fan we have used. " – Anne and Ian F.
Emmanuel F. – France – 2019/04/05. "I have just received the replacement engine. It is very pleasant to enjoy a silent fan matching the website description and my expectations. I can’t wait for the hot season to fully test it. I wanted to thank you for the efficiency of your after sales service, regarding my problem. "– Emmanuel F.
This customer replaced his Exhale Generation 3 Fan with the new Generation 4 model. “I just wanted to let you know that we’ve put up the fan today, and it was well worth waiting for. Absolutely fantastic product and we’re very happy with it. Installation was so easy as well. Kirsten & Reto – Switzerland – 2019/03/16. I have a very high ceiling - The exhale can channel the flow of hot air and redirect it downwards. the room is now perfectly tempered ! The flow is ultra soft and quiet. I chose "warm white" lighting, with adjustable light intensity (20% to 100%) : It is th best ! And cherry on the cake : the remote is very convenient and easy to use.